Professor Fergal O’Gara from University College Cork is the recipient of the Irish Thoracic Society Research Grant 2014 awarded under the HRB MRCG Joint Funding Scheme. Professor O’Gara’s project will investigate the impact of bile aspiration on chronic respiratory infections and study the unexplained link between gastro-oesophageal reflux (GOR) and severe respiratory disease. This study will have particular emphasis on patients with cystic fibrosis. This award is supported by GSK through an unrestricted research grant. 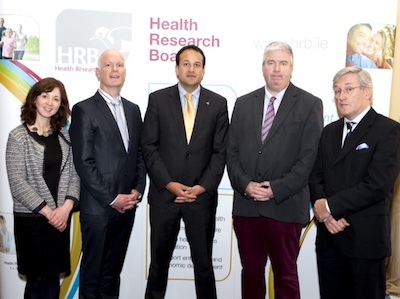 Pictured at the announcement of the Awards by Minister Leo Varadkar are: Ms Suzanne McCormack, ITS, Mr Graham Love, HRB, Minister for Health, Mr Leo Varadkar, Mr. Philip Watt, Chair of the MRCG and Professor Fergal O’Gara, UCC. HRB Medical Research Charirties Group, at the Royal College of Physicians.